In March 2017, the Vanderbilt student body received a letter regarding the beginning of the implementation of the university’s most recent land use program, Future VU, based in the administration’s Academic Strategic Plan. Focusing specifically on efforts such as diversity and inclusion, campus environment, trans-institutional collaboration, sustainability, and the communal principles of “One Vanderbilt”, the Future VU plan is currently in its final phase of development and will be fully completed in the next 20 to 30 years, with changes on campus visible as early as Summer 2018. Currently, Greek chapter houses have allocated parking lots, as well as street parking available on Kensington Place, 24th Avenue, and Vanderbilt Place. However, in effort to incorporate the West End Neighborhood with the rest of campus, Future VU seeks to remove all of the parking lots, West Side Row, and 24th Avenue and convert these areas into green spaces. According to VSG, this will encourage students to spend more time outdoors and on campus, as well as allow students not involved in Greek Life – about 65% of the undergraduate community – to utilize this space. 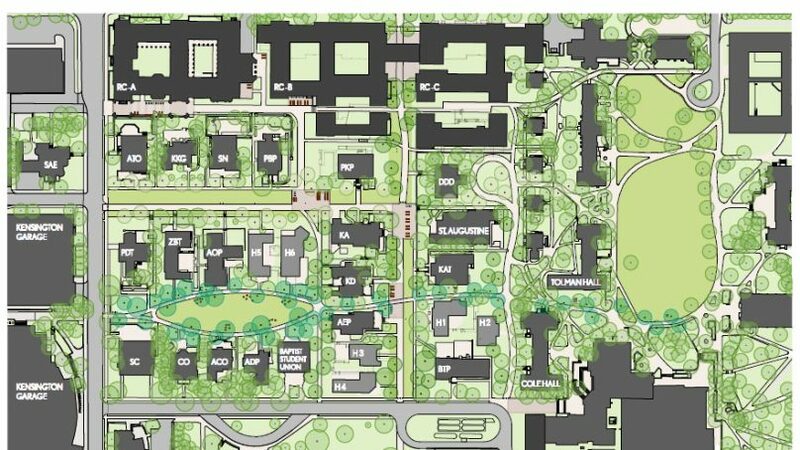 While this plan was passed by the Vanderbilt Student Government (VSG) and over 75 students participated in a meeting on March 15, 2017 to discuss this section of the Future VU plan, its contents have not been supported and viewed favorably in the eyes of many Greek community members, specifically in its potential modifications to the West End Neighborhood (Greek Row). At the same time, a student not involved in a Greek chapter, when asked about their opinions for the plan, was in support of the changes brought by Future VU. She believes that replacing the areas surrounding the chapter houses with grass directly aligns with the efforts of the recently created Greek Inclusivity Alliance, which works to make a “more culturally competent Greek community” and to build bridges outside the non-Greek student population through outreach events. Having wide green spaces for the entire community to use may open up this seemingly exclusive part of campus to all. From November 6-12, 2017, a Future VU “Pop-Up Park” was placed on Kensington Place to give the Vanderbilt community a taste of what the West End Neighborhood will look like in the coming years. Hammocks, chairs, and open spaces allowed for various events such as yoga and a pre-football game tailgate to occur, to the enjoyment of the participants. According to the VSG plan, the parking and backyards soonest affected will be those of Pi Beta Phi, Alpha Tau Omega, Sigma Nu, and Kappa Kappa Gamma. Surely, the re-beautification of the West End Neighborhood will transform our tradition of Greek Life at Vanderbilt, but whether the constructions will strengthen or hurt it in the eyes the community of is yet to be determined. I’m interested in making my own music blog site as well as I’m constantly looking through numerous music blogs throughout the day locating brand-new music first prior to other individuals that I know. But exactly how exactly do those blog sites discover that songs initially? Can I actually start by just posting the music I find on other blog sites?. I simply want to mention I’m all new to weblog and really loved your web page. Almost certainly I’m planning to bookmark your site . You amazingly have exceptional well written articles. Regards for sharing with us your website.